I just bought the best little item from Bed Bath and Beyond. It is from Real Simple Solutions and is called a "Roll - Up Ironing Pad." Most of the time, when I do have to iron, I drag the ironing board out of the storage closet down in the basement up into the kitchen. Needless to say, I need to reverse the trip when returning it to its proper place. 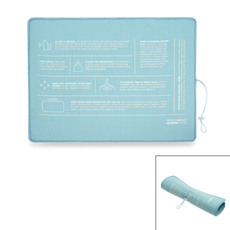 While I was shopping at Bed Bath and Beyond for some items for a party I was having, this roll-up ironing pad caught my eye and I could not help but put it into my shopping cart. I figured that if it was useless, I could always return it. Today I had to iron some pillowcases and shams. I opened my new roll-up ironing pad, placed it on the kitchen island, and started to iron. All done in no time and I didn't have to haul anything out of the closet, up the stairs and back. On the underside of the pad is a nonslip rubber backing so it does not slide around. The size is decent: 29" x 22". I even ironed a pair of pants in only 2 moves. This is really so simple.